Jan 18 Probiotics in Skincare: Game-Changer or Gimmick? I was flipping through the January issue of Glamour the other day when I came across a list of beauty ideas for 2016 by YouTuber Ingrid Nilsen. The third item on her list was how she's interested in skincare with probiotics in it. She explains that she always notices her skin is a lot "clearer, glowier, and happier" when she ingests probiotics, though we normally associate it with digestive health. But this isn't the first time I've heard about probiotics in skincare recently, so I decided it was time to learn a little more about it from the experts. Probiotics are the "good" bacteria that naturally occur in the gut (pro means good...get it?). They're what help with digestion, boost immunity, and also keep the growth of "bad" bacteria in check. So how does it relate to our skin? "Because every cell in the body is connected, our skin is a reflection of the overall wellness of the entire body," says Los Angeles dermatologist Howard Murad, MD. That means if our gut isn't healthy, then it'll show up on our skin through inflammation (i.e. acne, irritation, and redness). Experts agree a plant-based diet combined with probiotic supplements will improve gut health and also skin health as a result. That said, probiotics alone won't miraculously cure us of our skin concerns. Instead, they're just one component of an overall skincare and health routine that can make a difference. Probiotics are particularly helpful for those who have inflammatory skin conditions like rosacea and eczema, says Chevy Chase, MD dermatologist Elizabeth Tanzi, MD. As for probiotics in skincare, Dr. Tanzi told me there are no good scientific reports that show applying them topically helps, so it's best to ingest them if you want to reap the benefits. However, it still might be worth it to give skincare with probiotics a try since there haven't been too many tests on it yet. Plus, Dr. Murad says, "While the majority of the bacteria in our bodies are in our digestive tract, quite a large percentage of them live on our skin, which makes sense as this is the area that it exposed to the environment." He also adds, "It's helpful to look at ways to optimize the healthy bacteria wherever they reside in or on our bodies." 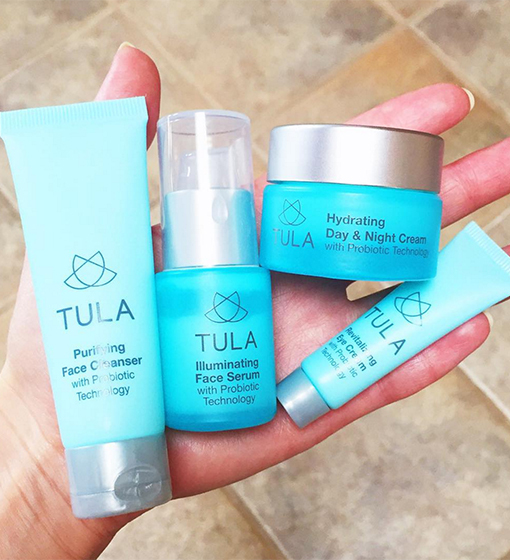 If you want to give it a go, check out the Tula Probiotic Skin Care Exfoliating Treatment Mask ($49) that Ingrid recommends. There's also Murad Transforming Powder Dual-Action Cleanser & Exfoliator ($30), which is a topical probiotic that's rich in lactic acid and enzymes. And then there's also the DIY route where you can apply yogurt to your skin like a mask since yogurt is packed with probiotics! As for me, I'm going to incorporate probiotics in both my diet and my skincare regimen to see if it makes a difference. Wish me luck! Jan 14 You Have to Try GlamGlow GravityMud Face Mask ASAP!